Amanda Leite’s daughter Nicole was running a fever while her family was shut in by Hurricane Irma. 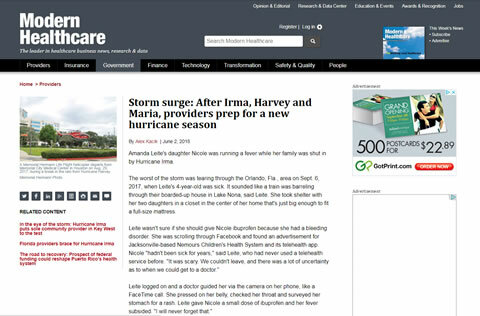 The worst of the storm was tearing through the Orlando, Fla., area on Sept. 6, 2017, when Leite’s 4-year-old was sick. It sounded like a train was barreling through their boarded-up house in Lake Nona, said Leite. She took shelter with her two daughters in a closet in the center of her home that’s just big enough to fit a full-size mattress.